There are a vast array of beautiful cheeses packing Swiss passports, and Wisconsin’s versions of pale, hole-ly Swiss cheese is our ode to the lot of them. 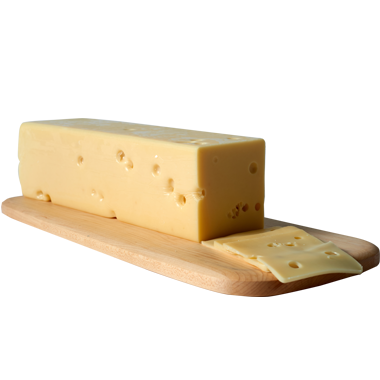 Our Swiss cheese is a kissing cousin to Switzerland’s emmental, and both cheeses are full of those naturally occurring and iconic holes. Wisconsin Swiss is rindless and locked and loaded with buttery, nutty and slightly sweet flavor. Whether you stick your fingers through it and nibble away, or serve it in a deli spread, this full-flavored cheese isn’t about to judge you. Its wants are simple and its motivations are pure. Just slice it, eat it and come back for more. Swiss is a long-storing cheese that doesn’t need special wrapping. It tends to sweat and get a little hard around the edges when left at room temperature for extended periods, so we recommend not leaving it out for too long. Nutty cheeses like slightly sweet sippers so we often pour bock, weiss beer, gewürztraminer, riesling, ice wines, port and sherry with Swiss. If stronger spirits sound best, then we recommend grappa and fruit brandies. Swiss cheese never met a deli spread it couldn’t make its own. We typically layer it on dark pumpernickel or rye sandwiches and grate it into casseroles and fondues. Wisconsin produces delicious potatoes so we’ll often melt Swiss cheese onto them whether it be hash browns or traditional Swiss-style rösti potatoes, gratins or gooey baked potatoes. Oh, and broccoli baked with swiss cheese and cream is sure to be a staple in your home, if it isn’t already!